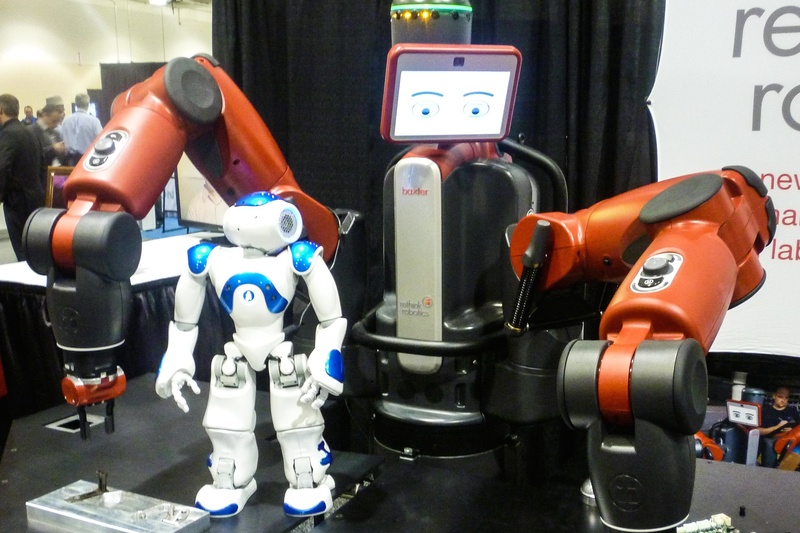 Roboticists who attend business conferences don’t always have kind words for humanoid robots. It’s not that walking, talking androids aren’t cool, particularly if one could take the trash out for you. But entrepreneurs and investors in robotics are looking for something far more practical—and profitable—in the near term. During his keynote talk, iRobot CEO Colin Angle poked some fun at his own work from his student days at MIT, saying that building a legged robot to walk up stairs is a waste of time. IRobot sells stair-climbing robots to the military that use tracks and flippers and are far more effective at the task. Similarly, making hand-like grippers with four or five digits often isn’t necessary when simpler and cheaper grippers can be just as effective. “The goal isn’t to create a replica of a person; it’s to solve a problem,” Angle said. Indeed, a walk around the conference floor showed that robots come in many different shapes—from tank-like machines with tracks, to robotic arms, to something that looks like a moving file cabinet. There were humanoid robots as well, but they used for research or very specialized needs, such as operating on the International Space Station. Collaborative robots. Historically, robots have been industrial machines on the factory floor that were kept away from people for safety reasons. But that’s been changing as designers build robots to work alongside people. That’s very much the point of Baxter, the manufacturing robot made by Rethink Robotics, which can be taught to perform a task by having a person move its arms. But the notion of having robots and humans working side by side is happening throughout the industry. North Billerica, MA-based Harvest Automation, for example, sells a small robot designed to move potted plants around greenhouses and nurseries and is now working on a robot to fetch goods in warehouses that fulfill e-commerce orders, CEO John Kawola told me. The company envisions that a warehouse worker would walk and put requested items in a milk crate-size bin placed on a lower shelf. Later, the robot, which only comes up to about the knee, would drive up and collect bins when they’re filled.